In industrial settings, lighting plays a major role in energy-efficiency, maintenance needs and workplace safety and comfort. Read how Versowood brought the wisdom of the woods to their lighting. 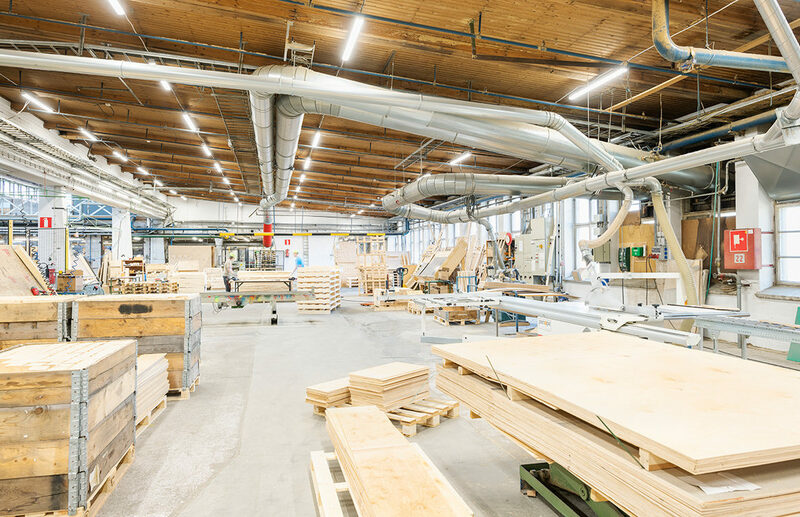 Versowood is Finland’s largest private sawn timber producer and sawn timber supplier. As a Finnish family company, they are a caring wood trader, listening to the needs of the grower and customer. Versowood Riihimäki’s first pilots with LED technology date back to 2012, when LED was still a relatively new thing. With positive experiences of the planing mill, Versowood started renewing the lighting of different properties one step at a time. Greenled has been trusted as the lighting solution partner ever since the first pilot to this day. In their recent lighting renewal of the pallet factory, the energy savings climb up to 63 % compared to the previous lighting. On top of energy savings, LED lighting has had a big impact on workplace safety and comfort. Ranging from very precise handicraft to hefty jobs, it’s important to make sure people have the right kind of lighting. Work tasks at Versowood’s factory range from very precise handicraft to hefty jobs. Eye fatigue can be a real issue if the lighting is not well designed. Running with fluorescent, high-pressure sodium vapour, multimetal and mercury lights, the old lighting was causing continuous maintenance needs that took up a lot of work hours to handle. In their recent project, Versowood has had their first experiences with a lighting control system. Smart lighting brings added value as energy savings and improved workplace safety. Employees no longer need to walk around the huge factory area to turn off lights and the lighting is never accidentally forgotten on. Provided as a turnkey solution, everything from planning to delivery, installation and commissioning was handled by the same supplier. When you ask them, why was Greenled trusted as their partner in lighting solutions?